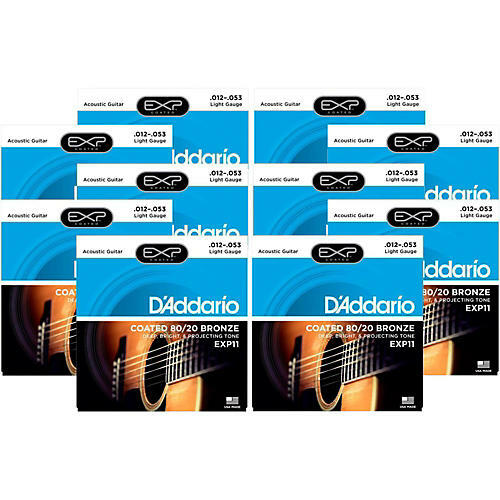 The 80/20 bronze wrap wire on D'Addario EXP11 Light acoustic guitar strings has a micro-fine coating applied to it before it is wound onto the hex-shaped core wire. The result is a built-in barrier against the corrosion and wear that can quickly sap the life out of your strings and your guitar's sound. D'Addario EXP11 coated guitar strings provide longer life and increased durability coupled with the brightness, clarity, and sensitivity you've come to expect from D'Addario acoustic guitar strings. And since the EXP coating is cross-linked to the wrap wire prior to winding, the strings sound fresh and bright. Coupled with D'Addario's compound-plated plain steel strings, EXPs are some of the longest lasting, most natural sounding coated strings you can buy.